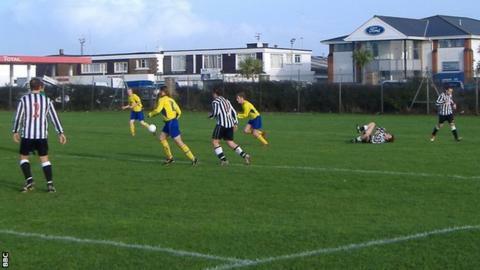 One of Jersey's oldest football clubs, Magpies FC, has folded. The club, which was formed in 1924, last summer because of a lack of players. They had kept their affiliation to the Combination in the hope of being able to resurrect the club but have not been able to find players or a manager. "It is very sad that we lose a club of that historical importance," said Combination president Tim Darwin. "In the 1950s, them and Beeches were the St Paul's and Jersey Scottish of today, so to lose a club like that is sad, particularly as I have personal links to them," Darwin, who was a player and administrator with the club before becoming president of the league in 2001, added to BBC Sport. The club celebrated its 90th anniversary on 24 May 2014 and had its heyday in the mid 1950s, winning titles in 1954, 1955 and 1957, to add to their first Jersey title in 1939, the last time the league was played before the start of World War Two. It means there are now 17 clubs playing football in the island, and while it is the lowest number for many years, Darwin said it did not mean the game in Jersey was necessarily in worse health. "You look at the size of Jersey and you think that 17 clubs is a lot for an island," he said. "You look back and there were more clubs, but the 17 clubs left are still running a lot of teams. "You can't put a positive on Magpies dropping out, but if you look back to when we had three divisions and 30 clubs, how many teams were they running? "The junior sections that these clubs are running are huge, so the number of people playing football won't be a lot less, there are a lot less clubs running them."